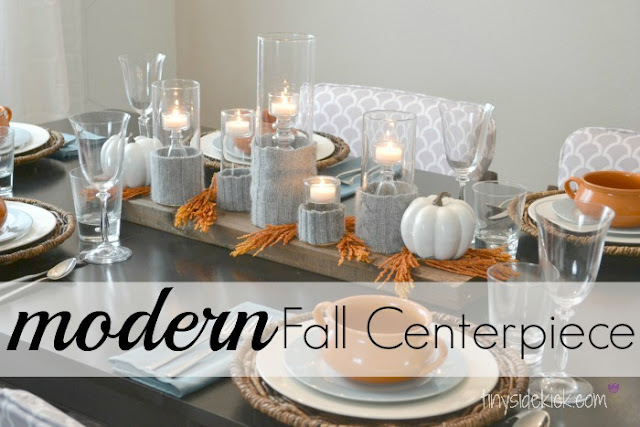 Inside: A quick and easy modern fall centerpiece! My Fall Centerpiece~ Last week you got to see some great fall table inspiration when I linked up with 4 others to show off our fall tables. I showed you how I mixed the warm tones of fall with the modern decor of my home and I have to say this is the first year where I am totally in love with it! Anyway, for my fall centerpiece I used sweaters to add texture and today I’m going to show you how simple it was! I had this old sweater that I loved (which is why after so many years of not even wearing it, it was still in my closet.) This is such a better use for it because I get to enjoy it all over again! And it was so simple. I simply cut the sleeves at different heights depending on the height of the candle holder. Then slipped the tube around the base of each glass candle holder. I didn’t glue them or anything because I use these candle holders year round. The end result is this modern centerpiece that has some unexpected textures. How cool is that? So what do you think? Are you ready for fall? Be sure to check out my Fall Candle roundup from Hometalk for 15 more fall candle ideas! I just bought a white sweater at GW today to make some of these candle cozies. I plan to use these in some Fall decor and also for Christmas. Your post was perfect timing! Don’t you love it when that happens. It is like decorating fate! They are so easy and you are right, they can go multiple seasons so easily! You should save some to make a sweater winter wreath. There is a tutorial for one I did last year on my blog under Holiday and Seasonal. These are so pretty! I might have to give these a try this year. This is so simple yet elegant and what a fun way to upcycle. a beloved stand-by! So glad you co-hosted at the pincentive party. just popping over to say that I have pinned, liked and tweeted, and g+-ed. I would love it if you would drop by my site at http://www.kneadedcreations.com for a short visit! I will look forward to seeing you there! Deb @ Kneaded Creations. 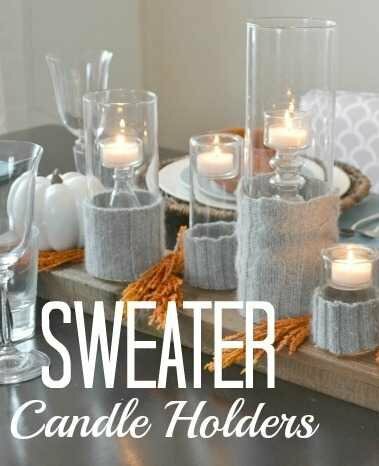 Your sweater candle holders make a perfect winter accent and centerpiece for your table. Thanks so much for sharing with this week’s Throwback Thursday party. Hello! very pretty! I invite you to participate in my link party every thursday http://www.thefamilyfunspot.com/2013/11/bloggers-unidas-1.html hope to see you there! Thanks Jocie! Very much appreciated! I LOVE what you have done. You should come show off your creativity at Craft Frenzy Friday! http://obsessiveandcreative.blogspot.com/2013/09/craft-frenzy-friday-6.html It won’t be a party without you! Thanks so much Rhonda! I’ll be there! Adorable! I love your entire table setting (and those chairs!!) Thanks for sharing on The DIY’ers! Thanks Kayla! Hope you are having a great week! Love this! Great way to repurpose the sweater and I love the soothing color scheme! Thanks Amanda! Just was at your blog and love what you did with that shirt! Love it! Thanks for linking it up to WIW party, hope to see you there tomorrow! Thanks Katie! I’ll be there! Corey, I love this idea! It makes the candles so warm and cozy! Amazing idea! Could be the perfect idea for a winter party!